Tandem Friends students enjoy endless experiential education opportunities in the classroom and on campus, putting to use our natural outdoor spaces, our stream, and even our bluebird houses as learning labs. Our students also participate in life-altering Experiential Learning or Service Learning trips. These overnight to week-long events happen early in the year and combine community building time as a class, subject area education, and outdoor education or actual service in the larger community. 5th and 6th graders camp overnight at Sugar Hollow and study natural habitats and water resources. 7th graders travel by train for a three-night stay in Washington, DC, sharing simple accommodations in a local hostel, and enjoying hands-on history and humanities at area museums and historic sites. In addition to their sightseeing experiences, students perform a full day of service for DC-area organizations that serve the homeless and the elderly. Other fun activities round out the trip. 8th graders will spend three days at Camp Friendship in Palmyra, Virginia, along with other local adventures. 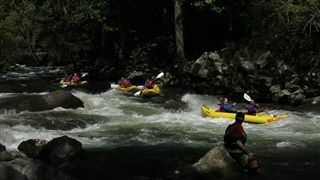 9th graders travel to North Carolina's Tsali National Recreation Area to bond over the Cherokee cultural experience, Appalachian arts and music, community service, whitewater rafting and mountain biking, and camping together at the National Forest Campground. 10th graders travel to Baltimore and partner with Baltimore Friends School to learn local history and culture and explore themes of social justice, identity and leadership. 11th graders spend a week in the Badlands of South Dakota, experiencing the land and culture of the Oglala Sioux, visiting Pine Ridge Reservation and Wounded Knee, and studying local geology, and grounding their year of American Studies through immersion in the heartland. 12th graders stay on campus for Senior Week to focus completely on the college application process at the start of their senior year; several local team-building activities are included.